The judgment was passionate, damning and very, very loud. "You're not fit to wear the shirt," Arsenal's traveling fans chanted as their team slipped to another morale-sapping away loss in the Premier League. The 3-0 setback at Crystal Palace on Monday was another low for Arsenal in a season that is shaping up to be the worst in Arsene Wenger's 20-plus years as manager. Mesut Ozil looked shell-shocked as he slumped to his haunches on the Selhurst Park field after the final whistle. Alexis Sanchez trudged off, head down. Theo Walcott even felt it necessary to apologize to supporters for the performance. A club in limbo off the field while it waits for Wenger to decide if he'll stay beyond this season, Arsenal is a team in a complete mess on it. Two wins from its last eight league games. Sixth place in the standings and on the slide. 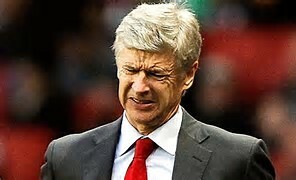 Four straight away losses in the league for the first time under Wenger, conceding three goals in each of those games. Champions League qualification has been a staple diet under Wenger for two decades, but that is looking increasingly unlikely. Arsenal is seven points off the top four with eight games remaining and the traditional late-season charge has yet to take off. Wenger's contract is up at the end of the season and, with a new two-year deal reportedly on the table, he has said that a decision on whether he'll stay at Arsenal will be made by the end of April. There's a chance now that he'll wait until the season is over. That's doing Arsenal no favors at all. Everything is shrouded in uncertainty. There's an increasingly toxic atmosphere around the club. The "Wenger Out" brigade is still in the minority but is making itself seen and heard. There's been footage of infighting among fans. The futures of Sanchez and Ozil — Arsenal's two big-name players — are up in the air, with their contracts set to expire at the end of the 2017-18 season. They might be waiting for Wenger's decision before committing one way or the other. And then there's Arsenal's planning for next season. How can the club have a transfer strategy if it doesn't know who will be in charge? Sanchez has been a revelation this season after being deployed by Wenger as a central striker instead of a winger, with his movement, intelligence and work rate posing non-stop questions for defenses. In February, he was the top scorer in the league with 17 goals. Wenger has recently decided to return Sanchez to the left wing, preferring either Danny Welbeck or Olivier Giroud up front. Arsenal looks less threatening as a result, with Sanchez not as involved and only scoring two goals in his last eight appearances — one of them against non-league team Lincoln in the FA Cup. He has looked disinterested in some games but remains vital to the team's hopes. Wenger must get more out of him. Oh, for the days of Emmanuel Petit, Patrick Vieira and Gilberto Silva running Arsenal's midfield. There's a lack of genuine quality in that area now, with Switzerland holding midfielder Granit Xhaka unconvincing in his first season at the club. Wenger has even said Xhaka is "not a great tackler" in terms of technique and decision-making — surely a key attribute in this position — having been sent off three times already. Francis Coquelin and Mohamed Elneny are also huge downgrades compared to midfielders from Arsenal's past, while Aaron Ramsey is a shadow of the player who starred at the European Championship with Wales last year. Arsenal's rhythm appears to hinge on the presence of technically gifted center midfielder Santi Cazorla. But he hasn't played since October — when Arsenal was top of the league — because of an ankle injury and won't return this season. Without Cazorla, Arsenal's midfield is slow and predictable. There are mentality problems on and off the field. Finishing in the top four and maybe winning a cup competition appears to be the height of Arsenal's ambition these days. As long as Champions League qualification is secured and UEFA money keeps rolling in, the board seems happy. That lack of ambition is starting to catch up with the club. There's so much competition at the top end of the Premier League and Arsenal is standing still. Even Everton — tied for points with Arsenal in seventh place — is showing more appetite for improvement under new majority shareholder Farhad Moshiri, who once had a stake in Arsenal. The mindset of Arsenal's players is also a concern. The team folds too easily in tough situations — the Palace game and back-to-back 5-1 losses to Bayern Munich in the last 16 of the Champions League over February and March are perfect illustrations of that — and some pundits have criticized Arsenal's players for their habit of taking post-win selfies in the dressing room. Alex Oxlade-Chamberlain and Walcott have fronted up after recent losses and given forthright opinions, while promising a "response." They are hollow words at the moment.